allows Bitbucket Server to send notifications about events to do with commit discussions, pull requests and repositories. See Using pull requests in Bitbucket Server. Note that if the mail server fails, notifications will be dropped. allows Bitbucket Server to email a link to a newly created user, which the user can use to generate their own password. allows a user to reset their password if they forget it. See Supported platforms for the mail clients supported by Bitbucket Server. Go to the administration area and click Mail server (under 'Settings'). Complete and save the form. The hostname of the mail server (for example "localhost" or "192.168.1.15"). The port of the mail server (if unspecified, the port 25 will be used). The username to use to connect to the mail server. The password to use to connect to the mail server. Use either SMTP or SMTPS when connecting to the mail server. SSL/TLS is used if supported by the mail server, otherwise mail is sent in plaintext. mail should only be sent if the mail server supports SSL/TLS. If the SMTP server supports the STARTTLS extension this will be used to encrypt mail with SSL/TLS otherwise plaintext will be used. SMTPS servers always support SSL/TLS. If the SMTP server does not support the STARTTLS extension mail will not be sent. SMTPS servers always support SSL/TLS. Specifies the 'From' header in notification emails (for example: noreply@yourcompany.com). Enter an email address to send a test email to check that the mail server is configured correctly. If you wish to set up the outgoing mail server as an anonymous user, simply leave the username and password fields empty. However, in Chrome, these fields may be auto-populated, leading to an error – as a workaround, try using a different browser. SMTP, where mail is not encrypted. SMTP encrypted by SSL/TLS using the STARTTLS extension, where the protocol conversation is upgraded only if SSL/TLS is supported by the mail server, but otherwise remains as plaintext. SMTP, where STARTTLS support is required on the mail server, otherwise mail is not sent. SMTPS (where the whole protocol conversation uses SSL/TLS). 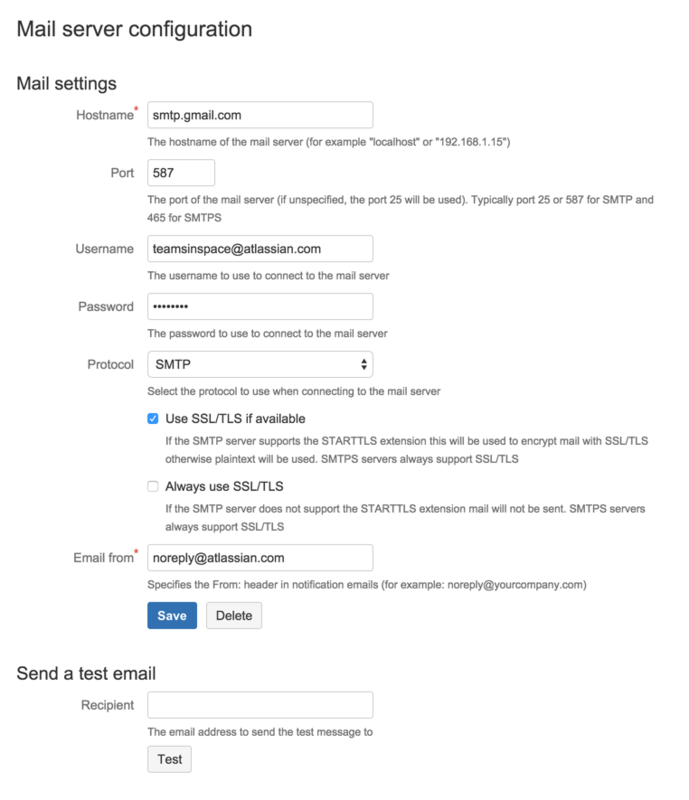 Note that if you use either SMTP with STARTTLS, or SMTPS, and connect to a self-signed mail server, you may need to import the server's cert ificate and set up a custom cacerts file for Bitbucket Server (just as you do for any outbound SSL/TLS connection to a self-signed server). See this Bitbucket Server knowledge base article for information about how to do that. If you wish to connect to a Gmail account for email notifications in Bitbucket Server, refer to the Configuring the Mail Server to Use Gmail guide. In particular, note that Gmail won't show images in the email because of the way that Google loads images on their servers. For Google Apps, a Bitbucket Server administrator can solve the problem by adding the Bitbucket Server domain name to a whitelist – see https://support.google.com/a/answer/3299041?hl=en for more information.